For my birthday gift, my sister Mallory decided to take me to one of our favorite seasonal places - King Richard's Faire in Carver, MA. We had visited for the first time one Sunday last year, and enjoyed ourselves so much that we went back one week later! Both Mallory and I scored some great T-shirts and jewelry, and even had a great meal. We couldn't wait to return. With free parking, I pulled into the large dirt lot at around 2:30 p.m. and found a space close to the entrance. I noticed that Mallory had worn flip flops, which was a little insane considering we'd be walking on dirt and rocks the entire time. Mal shelled out $50 for admission (adults - $25; kids 5-12 - $14; kids under 5 - FREE) and we walked through the entrance and handed our tickets to a waiting wench. Our strategy was to walk around once, pick out what we liked, and then walk around a second time to buy everything. Then, we were off to have lunch. King Richard's Faire has something for everyone. Although Mallory and I don't dress up, you can rent costumes or arrive in your own! There are games, joust tournaments, a royal zoo, jewelry shops, a few ancient-looking rides, and various artisans selling clothing, swords, walking sticks, leather goods, and assorted knives. There are also several psychics, tarot readers, face painters, shows, musical performances, and strolling musicians. It is a typical Renaissance faire with all the trimmings. It's quite a spectacle, and if you haven't been to a Renaissance faire yet - go! Everyone seems to enjoy themselves. After our second trip around the large faire, Mallory and I were ready to eat. We stopped at the ticket booth to purchase tickets (the food area does not take cash). Although a little pricey at $5 for a sheet of 10 tickets (there is a $5 minimum), both Mallory and I had to get two sheets of tickets each in order to get what we wanted. 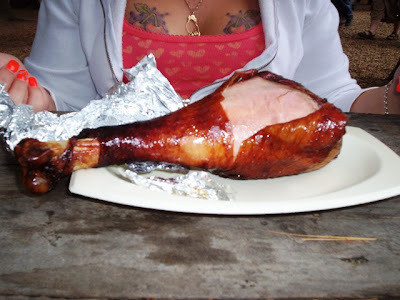 Since last year, Mallory had been talking about getting the famous roasted turkey leg. 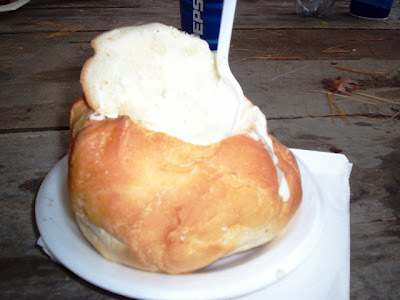 I was a little less adventurous, but went with another faire favorite - the King's Chowder Boule. We stood in line at the New Castlegate Grill, one of the many food sections, and placed our order. Mal's turkey leg was 14 tickets, while my boule was 13. We each ordered a "servant" sized Pepsi (five tickets), and took our seat at a nearby picnic table. I like the way the eating area is set up here. Everything is in a large circle, with the ticket booth right across from the tables. Each "window" has its own name - The Canterbury Kitchen, Potions, The Vinery, Witches' Kitchen, Hex Kitchen, Village Oven, Royale Sweet Shoppe, Ye Creamery, and Roaming Delights. Some of these areas are located between the many shops, but the majority are right in the center of the faire. Serving favorites like the dragon wings n' fryes, shepherd's pye, stuffed po-ta-toe, Lord's pigge sandwich, rack o' ribs feast, and the King's roasted nuts, you can really pig out here - but be careful. The food can really add up. For those ready for something more adult, there are several areas that serve large yards of beer, mead, and different wines and champagnes. Mal and I were tempted to try the mead, but wanted to save it for our next trip since our funds had steadily declined since stepping foot through the entrance. Mal's turkey leg was insane. It was a good size and smelled delicious. She peeled back the skin (she hates skin) and dove in. It actually had a strong flavor of pork. It was roasted and had a delicious smokey flavor. She thought it was amazing, and she definitely had a fun time using her hands to eat her lunch. My chowder boule was delicious! The chowder tasted homemade, and the boule they used was soft and fresh. I was impressed at how hot everything was, considering that everything is outside and there were quite a lot of hungry kings and queens waiting to be served. After nearly being scared to death by a passing monster, Mallory and I started to plan ahead for our next visit to King Richard's Faire. We're going to order the chicken, fryes, and the King's Towering Chocolate Cake, which seems to be quite a hit with patrons. We also can't wait to revisit our favorite shops - The Silver Lady, The Remembrance Shoppe, and Uncommon Adornments. All in all, we had a great time and can't wait to go back. However, I definitely suggest bringing a lot of cash if you go with your family. Although there are ATMs available, only some of the merchants accept credit cards. King Richard's Faire is open this year until October 21 from 10:30 a.m. to 6 p.m. on Saturdays and Sundays. 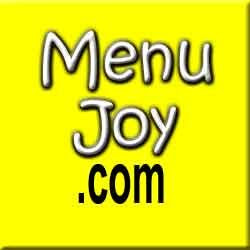 Discount coupons are available on the Web Site, along with a list of merchants, games, food, and a map of the park. You'll definitely have a royal good time!